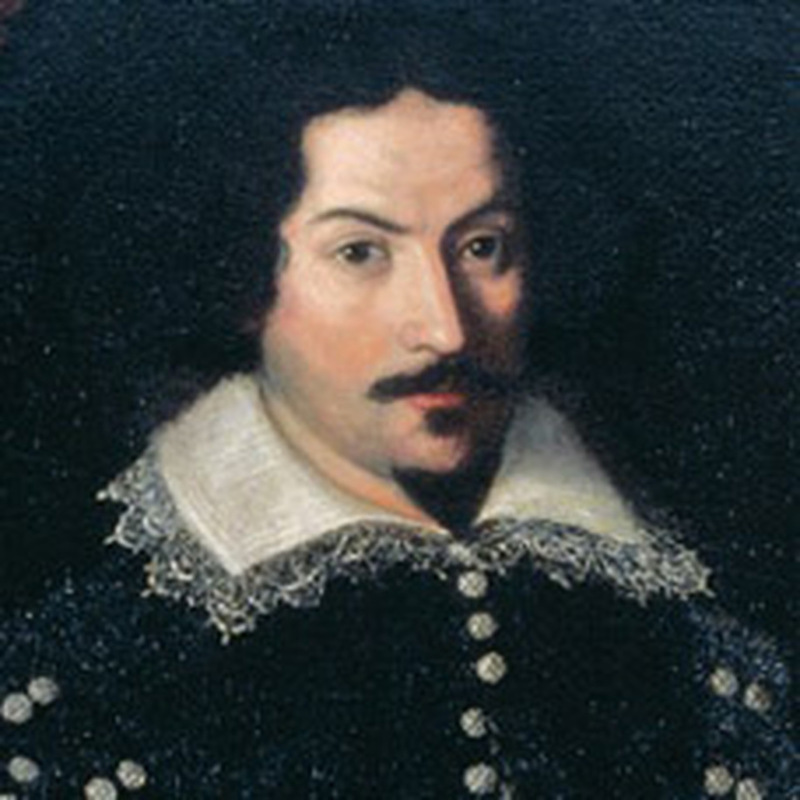 The architect Carlo Maderno, who has been described as one of the fathers of Italian Baroque architecture, died on this day in 1629 in Rome. His most important works included the facades of St Peter’s Basilica and the other Roman churches of Santa Susanna and Sant’ Andrea della Valle. Although most of Maderno's work was in remodelling existing structures, he had a profound influence on the appearance of Rome, where his designs also contributed to the Palazzo Quirinale, the Palazzo Barberini and the papal palace at Castel Gandolfo. One building designed and completed under Maderno's full control was the church of Santa Maria della Vittoria in the Sallustiano district. Maderno was born in 1556 in the village of Capolago, on the southern shore of Lake Lugano in what is now the Ticino canton of Switzerland, part of the finger of Italy's northern neighbouring country that extends between the Italian lakes Como and Maggiore. Marble was quarried in the mountains around Capolago and as well as a talent for sculpture he had experience as a marble cutter when he moved with four of his brothers to Rome in 1588 to work with his uncle, Domenico Fontana. Fontana also made his architectural mark in the city, where he worked on the Basilica of Santa Maria Maggiore and the nearby Palazzo Montalto. 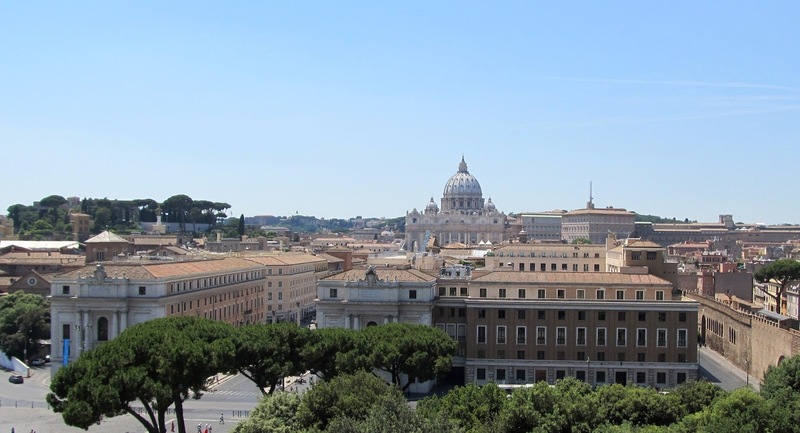 He also erected the 327-ton Egyptian obelisk at the centre of St Peter's Square as well as the obelisks in Piazza del Popolo, Piazza di Santa Maria Maggiore, and Piazza di San Giovanni in Laterano. 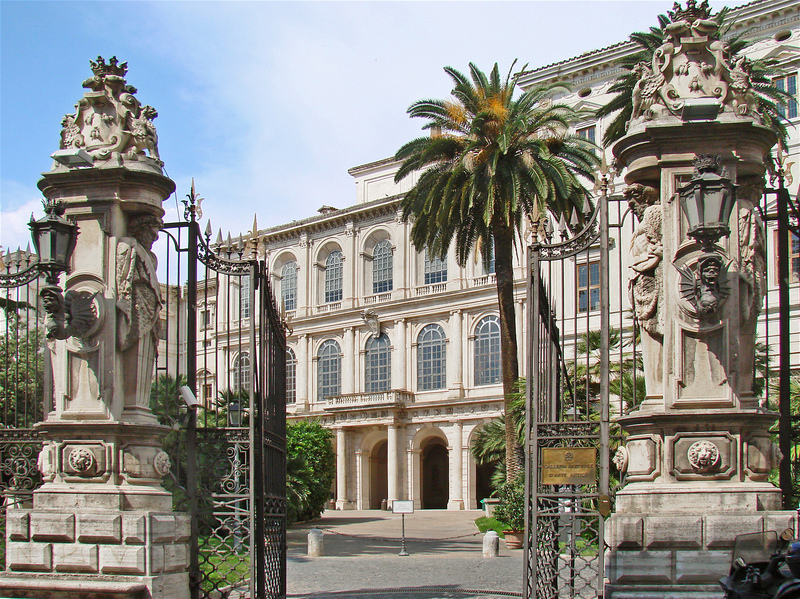 Maderno's first commission in his own right, in 1596, was to build a facade for the church of Santa Susanna at the Baths of Diocletian, located on the Quirinal Hill. Completed in 1603, Maderno's work on Santa Susanna has earned praise from modern architectural critics and at the time won him the admiration of Pope Paul V, who appointed him as the architect of St Peters, a position previously held by Domenico Fontana. 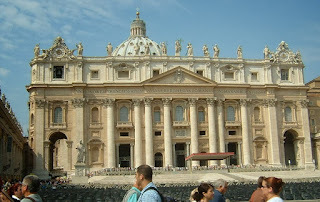 Extensive changes to St Peter's Basilica were demanded of Maderno by Paul V, both inside and out. Principally, he was required to modify Michelangelo's plans by adding an extended nave and a palatial facade. His work on the inside, which changed the layout from Michelangelo's Greek cross to the present Latin cross, is generally seen as a seamless expansion but the facade has been condemned by some critics as a disaster. 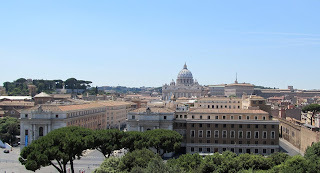 Their main complaint is that the massive classical structure, with its lower two levels in brown stone and the top level in white marble, severely limits the view of Michelangelo's magnificent dome, despite it being the tallest in the world, particularly for the crowds looking up from the piazza. The eight unevenly spaced columns have also divided opinions, praised in some quarters as a forceful statement, criticised in others as incongruous. Happily, more blame was attached to an over-ambitious and architecturally ignorant pope than to Maderno himself. There is an acceptance that he had much less freedom over the design than in his other projects. Maderno's influence is seen too in the churches of Gesù e Maria, San Giacomo degli Incurabili, Santa Lucia in Selci and San Giovanni dei Fiorentini, where he is buried. 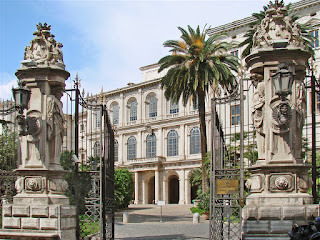 The Palazzo Barberini, which Maderno designed for the family of Pope Urban VIII, was completed by Francesco Borromini and Gian Lorenzo Bernini. 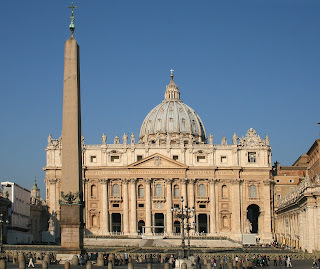 From conception to completion, St Peter's Basilica took more than 150 years to build. Suggested by Pope Nicholas V in about 1450, at which time the original St Peter's was near collapse, it was not finished until 1615. Although the principal design input from the laying of the first stone in 1506 came from Donato Bramante, Michelangelo, Maderno and Bernini, contributions were also made by Giuliano da Sangallo, Fra Giocondo, Raphael and Antonio da Sangallo. Michelangelo became involved with reluctance, ironically, after Pope Paul III's first choice as architect, Giulio Romano, died before he could take up the post and second choice Jacopo Sansovino refused to leave Venice. For all that the view from close quarters may have been impaired, Michelan- gelo's dome is one of the dominant features of the Rome skyline. Situated in the Vatican City next to the Tiber river, St Peter's is the largest Christian church in the world, covering 5.7 acres with a capacity to accommodate 60,000 people, with room for a further 400,000 in the square outside. The dome itself rises to a height of 136.57 metres (448.1 feet) from the floor of the basilica to the top of the external cross. The Egyptian obelisk in the square, which rises to 40m (132 ft), is said to have been erected at or near the spot in which St Peter was allegedly crucified by the Romans in 64 AD.